Last minute changes to the Round Ireland Race fleet means ISORA Champion Mojito (Vicky Cox and Peter Dunlop), a pre-race favourite, are out of tomorrow's race. David O'Brien predicts in today's Irish Times Sailing Column that the light winds will favour the proven J109 design, of which North Wales based Mojito, was one of four due to compete. The latest entry list from Wicklow organisers features a number of amendments as some boats have become unavailable or unable to prepare in time. The Pwllheli entry is one of five withdrawals. Also out is the Open 50, Pegasus of Northumberland, the Corby 25, Tribal and the Spirit 54, Soufriere and the 'May Contain Nuts' entry. Originally 60 boats were expected to start but the confirmed entry-list stands at 55 with boats from seven countries - Ireland, Britain, France, The Netherlands, Finland, Norway and the United States. Glorious conditions for the 55 boats competing in the Volvo Round Ireland Race are expected over the coming week after the 705-mile classic gets underway at Wicklow Sailing Club on Saturday at 2pm. The Irish Defence Forces will have a big presence at Wicklow including the Naval vessel Ciara in attendance and a display by the Air Corps Black Knight parachute team in the afternoon. A crew of Army and Naval personnel on Joker 2 will compete in the race aiming to lift a new trophy for military teams. The forecast for the week suggests light, north-easterly winds for the start meaning the colourful spinnaker sails will be used, adding to the spectacle. Wicklow pier and the Black Castle area are ideal viewing areas. Parking and traffic restrictions will be in place. Boats range in size from 21 feet to 65 feet and the fastest entries are expected back in Wicklow by Wednesday evening. However, some of the smaller entries may not finish until next weekend depending on wind conditions. A week-long festival is already underway with family-friendly events running from 10am on race start day at Wicklow Harbour leading up the dockside farewells to the fleet before the crews head southwards. The Volvo Round Ireland Race 2018 - in just eight weeks time on June 30th from Wicklow - will be marking 20 stagings of this biennial classic. When first raced in 1980, it was with a fleet of very modest numbers, mainly of boats of the day. Thirty-eight years later, you’d expect significant change in any sport - and especially so in a vehicle sport like sailing. In our crazy game, developments in hull design, construction techniques, sail innovation, and rig configuration can see some previously unbeatable craft appear to age very quickly writes W M Nixon. Yet other boats, thanks to some seemingly timeless basic concept, plus the best uses of the International Rating Certificate and the devotion of a loyal owner and dedicated crew, just keep going on and on and on, almost always in the frame. Thus a fleet like that which will be racing round Ireland will be an extraordinary mixture of newer craft set against decidedly vintage boats, with many coming under some sort of “in between” category. Paul O’Higgins with the JPK 10.80 Rockabill VI – one of the newer boats - will be spearheading a remarkable Royal Irish Yacht Club group challenge in the 50-plus fleet, in a campaign which he will regard as dealing with unfinished business. O’Higgins was the November 2017 Afloat.ie “Sailor of the Month” in recognition of his sporting approach to sailing. For even when - as in the annual early winter Turkey Shoot series in Dublin Bay – he is allocated a handicap so fierce that he almost has to be finishing when the other boats are starting if he is to have any chance at all of being in the prizes, nevertheless he still goes out and gives his fine boat a canter round the bay. Equally, he took part in the Calves Week Regatta in West Cork in August in the right spirit, crewed by family and friends. In this case, though, as he was well away from Dublin Bay, he was able to win prizes too. But earlier in the year, we had seen the more serious side of Paul O’Higgins when he and Rockabill VI shipped aboard some seriously heavy hitters for June’s Volvo Dun Laoghaire to Dingle Race, and they won going away. It was his most notable major win to date. When the boat was still fresh out of the package in June 2016, it had looked as though Rockabill VI had her class neatly stitched up in the Volvo Round Ireland Race. But they hit one of those spooky localised calms in which this 704-mile classic seems to specialise, and sat going nowhere just east of Inishtrahull for three hours, while Dave Cullen from Howth YC and his merry men were making hay up the west coast of Donegal with the J/109 Euro Car Parks in a new wind, and this swept them into the class win that they held to the end. The two crews socialized together mightily in Wicklow Sailing Club at the finish. But since then an interesting development has shown that Paul O’Higgins is seriously keen to take the Round Ireland trophy in 2018. The word was soon out on the waterfront that Mark “Mono” Mansfield of Cork, one of the key players in Euro Car Parks’ Round Ireland win, would definitely be doing the next race - but this time it would be aboard Rockabill VI. However, having past winners on board in the RIYC group effort Round Ireland goes well beyond Rockabill VI’s battle-hardened crew. The top Irish boat overall in the 2016 race was the First 44.7 Lisa skippered by Michael Boyd RIYC. As revealed here last week, he’ll be back in 2018, but this time with the J/109 Jedi chartered from the Irish National Sailing School, with school principal Kenny Rumball (incidentally also RIYC) part of a very complete package. And of course Boyd has further Round Ireland form going right back to 1996, when he won overall with the J/35 Big Ears. Referring back to the Afloat magazine of August 1996 which reported that race (and God be with the days of leisurely deadlines set by periodical printing dates), we find that the entire crew of Big Ears were jointly the Afloat “Sailors of the Month” for August 1996, and they were Michael Boyd, Jamie Boag, Patsy Burke, Brian Mehigan, P J Kennedy, Tim Greenwood and Michael Moloney. But perhaps most importantly, the citation also includes Niall Dowling, who was responsible for getting the boat race-prepared at the Royal Irish Yacht Club. He has spread his wings more than somewhat since, and is a major force in Solent sailing, such that he and Michael Boyd teamed up to make Quokka 8 available as the “Steady Eddy” third boat in the winning Irish Commodore’s Cup Team in 2012. And for 2018, Niall Dowling is back in the Round Ireland scene, but this time with the Ker 43 Baraka GP, which was formerly the highy-successful New Zealand-built American-owned Otra Vez. 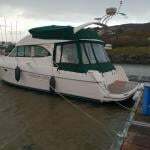 The fact that since 2016 there has been a linkup between Wicklow Sailing Club and the Royal Irish YC, whereby the latter offers hospitality to Round Ireland entrants in the week before the race, is the ideal package for boats like Baraka GP, as she can be safely kept in what is arguably the best berth on the east coast of Ireland before sallying down to Wicklow for the start. But as several seasoned round Ireland campaigners have readily argued, Wicklow is the only place from where the race should start. Not only did the Wicklow club set it all up in the first place so many years ago, but they have stuck doggedly with it since through thick and thin, and the entire town is in the Round Ireland mood as the start approaches. Equally important, no matter how little wind there is, the sluicing ebb out past Wicklow Head soon moves the fleet on its way, whereas a Dun Laoghaire start would find itself competing for space with the intricate Dublin Bay sailing scene, and maybe going nowhere very fast. That said, in the week beforehand, the growing excitement at the RIYC’s unrivalled totally-sheltered waterfront location is part of an extraordinary ongoing saga which concludes with crews savouring the unique post-finish atmosphere in Wicklow SC – undoubtedly one of the world’s best decompression chambers. It can become so congenial that we’ve done the circuit with a noted skipper on an 83ft Maxi, and then, having celebrated our finish, we’ve taken our leave of ship and crew with the words of the skipper ringing in our ears, that he too must soon hasten away with the boat to get back to her home port…… Yet a day or two later, we hear that they haven’t gone away you know - the après sailing still goes merrily along in Wicklow Sailing Club. It’s something very special. Naturally, there are those who’ll say we’ll never again reach the heights of 2016, when George David’s glorious Rambler 88 set the pace for both line honours and the overall corrected time win, while the three 70ft MOD trimarans battled to the very end – and we mean the very end – to be first to finish and set a new round Ireland record. But Race Officer Hal Fitzgerald of WSC tells us that in terms of solid genuine IRC entries representing Europe’s core offshore racing fleet, they’re actually ahead of the 2016 listing. And while the biggest boat may be “only” 65ft (she’s Richard Loftus’s keenly-campaigned vintage Swan 65 Desperado) there are interesting developments taking place at the other end of the size spectrum. Sailmaker Yannick Lemonnier of WestSails.ie in Galway makes no secret of his enthusiasm for the MiniTransat 650 boat concept, and last year he persuaded the Volvo Dun Laoghaire to Dingle Race organisers to permit three Irish-based MiniTransat boats to sail along with the fleet as a sort of associate entries. Let it be said that they were by no means at the back of the bunch when they finished, as they set as much sail as your average 30-footer, and their crews are hyper-keen. But in order to attract attention from the main MiniTransat fleet heartlands in France, Lemonnier reckons that it’s the Round Ireland Race which has the real magic ingredient, and his enthusiasm has persuaded the Committee to include an “Associate Division” for two-handed MiniTransat boats, and they’ll be allowed to start with the main body of the fleet. This latest twist in the story of a great race will in time become part of its mythology, which goes right back to that first race of 1980, when Johnny Morris of Pwllheli with the High Tension 36 Force Tension took line honours clear ahead of Dave Fitzgerald’s 40ft Partizan from Galway, with the IOR winner being the late Jim Poole’s Half Tonner Feanor. But the “real” winner, under a handicap system set up by Wicklow SC to attract boats which mightn’t normally contemplate cut-throat offshore racing, was Brian Coad’s plump Rival 34 Raasay from Waterford, beginning a Coad-Round Ireland partnership which went on for years. And it was with the 1982 race that we realised the Round Ireland had really arrived. The great Denis Doyle turned up from Cork with the almost-new Frers 51 Moonduster, already the undisputed Queen of the Irish offshore fleet and an international star in European waters in RORC racing. The Doyle seal of approval was the making of the Round Ireland race, and he was always there on the start line until the end of his days - he kept the lovely Moonduster for an exceptionally long time. The pace of his involvement was top level from the start. He set a course record which looked pretty unbeatable in 1982, but then promptly bested it in an extraordinary circuit in 1984, going at such a pace that, as navigator John Bourke neatly put it, “we were seeing off an entire Irish county in every watch”. Since then other names have become a leading part of the story, people like Eric Lisson from Cork with Cavatina and Peter Wilson with Bridgestone and Dickie Gomes from the north with a variety of boats called Woodchester and Eamonn Crosbie from Dun Laoghaire with boats of small comfort but high speed, while Colm Barrington showed us what could be done with a Volvo racer as the race developed such that it is now an integral part of the Royal Ocean Racing Club calendar and points system. In fact, a gathering of the Round Ireland veterans from down the years who are still happily with us would make for an extraordinary assembly. But perhaps it’s better left to the imagination – these things can get out of hand. Way back in 1972, it was decided to hold an Irish Fastneteers Dinner for everyone who had ever done the RORC Fastnet Race on an Irish boat. It was a spectacular social success, an unrivalled reunion. But anyone who claims to remember it clearly very evidently wasn’t there, as it was that kind of party - the sort of tearaway memory-blocking affair you used to get back in the days before health warnings about safe units of personal alcohol consumption curbed things more than somewhat. And in any case, it’s much healthier to live in the present and anticipate the near future, which is what the up-coming Volvo Round Ireland Race is all about. The fleet will range between Desperado at the top end (unless somebody is planning to spring a last-minute very big boat surprise, which wouldn’t really surprise us at all) and the MiniTransat “unofficials” at the other end, with mostly boats between 35 and 55ft in between. The one which has won most is probably Cavatina, while the oldest must be Darryl Hughes’ restored classic 43ft 1937-built (at Arklow) gaff ketch Maybird. On many boats, there’ll be people doing their first Round Ireland. There really is nothing quite like it. Unless you’re a professional and the pre-race display routine is part of the job, it has to be said that Wicklow Harbour in the hours leading up to the start is a nervy and over-crowded place, and secretly you wish the fleet could be allowed to start at one minute intervals in the dark, with no attention whatever. But then after you’ve sailed at least 704 miles along one of the greatest coastlines in the world, a completely new Wicklow appears ahead. Ideally, it would be a summery mid-afternoon with the Wicklow Hills looking their very best. You close in for the finish and find you’ve done well enough to be in the frame, even if Michael Horgan and Peter Ryan have gone well enough to grab the class lead. Wicklow SC is in best decompression chamber mode, with welcome showers and pints and much banter and laughter. And then your son, who has raced round Ireland with you, makes it quite clear that you and your oldie mates are now superfluous to requirements - he and his pals will take the boat back to Howth in due course. So his mother appears as though by magic, and takes you up into the Wicklow Hills for a leisurely feed of the best Irish stew at the Roundwood Inn as the sun slowly works its way towards setting in sublime style. And all is very well with the world. As entries continue to grow for the 2018 Round Ireland Yacht race, with 30 boats currently entered, Wicklow Sailing Club have announced a new trophy/category for the 2018 race – yet to be named – to recognise the best armed forces entry. Military teams have always had a strong connection with the race and this decision by Wicklow Sailing Club to announce a new trophy for this category recognises that strong contribution throughout the years as do similar trophies in other offshore races such as the Fastnet race and the Beaufort Cup. The newly announced trophy will attract interest and bolster the profile of the race within armed forces all across Europe, where offshore sailing is recognised as an invaluable teambuilding and leadership development platform. The close proximity of the Volvo Round Ireland to the hugely successful Beaufort Cup, held as part of Volvo Cork Week, means military teams travelling to Ireland can do both events very cost effectively. With 15 weeks until the race starts on 30th June 2018, Wicklow Sailing Club is looking forward to welcoming competitors and supporters to the event and to what promises to be a true celebration of sailing. Early bird entries closing date is 30th March. Enter online at www.roundireland.ie and join us at Wicklow Sailing Club for the 20th staging of the race. It’s the end of an era. Theo Phelan of Wicklow, who has been intimately involved with the organsation of the biennial Round Ireland Race since 2008, has stood down from his demanding and time-consuming position after ten years in roles of increasing responsibility with the race organisation writes W M Nixon. During those years as he progressed towards being Race Organiser for 2012, 2014 and 2016, he guided the classic event as it survived decline in the grim post-recession years, and brought it to new strength as the records-breaking Volvo Round Ireland Race of 2016. Always mindful of the need to make the following of the race a more accessible experience, he introduced Race Trackers with such determination that it is believed the Round Ireland was the first mainstream race to make them mandatory. He also strengthened the links with the Royal Ocean Racing Club to consolidate the Round Ireland’s position in the international calendar, and he developed Wicklow Sailing Club’s co-ordination with the Royal Irish Yacht Club in Dun Laoghaire in order to provide the largest boats with a suitable pre-race base. Speaking to Afloat.ie today, Wicklow SC Honorary Secretary Peter Shearer – himself a longtime member of the Round Ireland Organising Committee – praised Theo Phelan’s dedicated contribution: “It was mainly thanks to Theo Phelan’s determination and dedication that we saw our core event become the hyper-successful Volvo Round Ireland Race 2016. It was a remarkable story of success”. The Atlantic Anniversary Regatta is the first ever regatta series with two Atlantic Ocean races in both directions. Celebrating the 150th anniversary of the Norddeutscher Regatta Verein (NRV), based in Hamburg, Germany. The first part of this extraordinary series was completed in December 2017 with the 2017 RORC Transatlantic Race from Lanzarote to Grenada. The final part of the race series will see the fleet race 3500 nautical miles from Bermuda to Hamburg, starting on 8th July 2018 and it looks like top two sailors in the 2016 Round Ireland Race are favourties in the Anniversary Race too. For the Bermuda to Hamburg race, George David's American Maxi Rambler 88, is the hot favourite for line honours but his Wicklow challenger from two years ago, Eric de Turckheim in a new 54ft Teasing Machine will also be in contention. In three different yachts, all called Rambler, George David has raced west to east across the Atlantic on three occasions. In 2007, Rambler 90 took line honours in the HSH Nordbank Transatlantic (11d 16h 13m 59s). In 2011, Rambler 100 took line honours in the Transatlantic Race, establishing a race record (6d 22h 08m 2s). In 2015 Rambler 88 completed the Transatlantic Race winning IRC One (7d 16h 54m 46s). This will be George David's sixth transatlantic race in both directions. Over 30 teams have expressed their interest to race from Bermuda to Hamburg, competing for Line Honours and under the IRC, ORC and ORCsy rating systems as well as one design Classes like IMOCA and Class 40. Confirmed entries include top performers from the 2017 RORC Transatlantic Race: Overall winner, Eric de Turckheim's Teasing Machine. Winner of the ORC Division, Outsider skippered by Dr. Harald Brüning. Winner of IRC One, Hamburgische Verein Seefahrt's Broader View Hamburg, and winner of the Class40 Division, Mathias Müller von Blumencron's Red. While the Volvo Round Ireland Race 2016 was the most international ever seen, some of the keenest racing was among the Irish boats in a fleet of such quality that just to secure a class win was to have made an outstanding achievement. In the end, while there were many Irish boats which were there or thereabouts in their respective classes, there was only one class winner from Ireland. And that was Dave Cullen of Howth racing the chartered J/109 Euro Car Parks. Although he has raced round Ireland in a Half Tonner in times past, the enthusiastic Cullen reckoned that for today’s fleets, a J/109 offers a better proposition. So he left his lavishly-maintained Half Tonner Checkmate at home, and put his usual eclectic crew of all the talents aboard the chartered J/109 which became Euro Car Parks. Yet despite the very evident sponsorship, this was by no means a “no expenses spared” campaign. It was run on a tight budget, and it relied on the talents of such as Mark Mansfield and Maurice “Prof” O’Connell in the crew to bring the boat home on time. And it was a mighty test of character. They weren’t well placed passing the Tuskar, but in the harsh slug along the south coast, Euro Car Parks crew sailed like men possessed, and by the time they were approaching the Fastnet, all the other J/109s were nowhere, relatively speaking. But there were many other boats in the fleet and in Class 3 to give them a hard time, and the second setback came off the mouth of Bantry Bay early on the Monday morning. The good winds had moved a few miles further north, and Euro Car Parks found herself headed inside Dursey Head, requiring a painful beat in a lumpy sea to get back on track. By that time their most significant class rival, Paul O’Higgins’ new higher-rated JPK 10.80 Rockabill VI, was making such good progress up the west coast that she rounded Tory Island forty miles ahead of Euro Car Parks. Yet the Cullen crew never slackened the pace, and when a localized calm at Inishtrahull stopped Rockabill VI for an excruciating three hours, the J/109 kept up the pressure, going from being far astern to relatively close astern by the time Rockabill got going again. For the smaller craft, the rest of the race was torture, as the big winds which had sent the leaders and larger craft round at such speed were now fading, and the final agony was a period of calm eastward of Drogheda on the Wednesday evening. Yet they kept going, they were in the hunt and at the finish for Class 3 on IRC it was Euro Car Parks first, Rockabill VI second, and Conor Fogerty’s Sunfast 3600 Bam! third, making Dave Cullen our Afloat.ie Sailor of the Month for June 2016. INSS School principal and skipper Kenneth Rumball reviews his tenth place overall in Volvo Round Ireland 2016 on board the INSS Reflex 38, Lynx. The idea for the Irish National Sailing & Powerboat School to compete in the Round Ireland Yacht race was hatched even before the company planned to enter into the yachtmaster business. 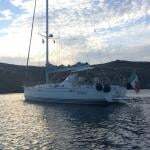 In fact when selecting a yacht for our competent crew, dayskipper and yachtmaster teaching duties, we made sure to select a boat that could not only fulfil our teaching duties but could look after an amateur crew while also competing at the highest level offshore. Our Reflex 38 spent her first year primarily away from racing duties before undergoing significant race preparation ahead of this year’s Round Ireland Yacht Race. Our hull was stripped back and freshly antifouled, electronics upgraded, sheets and halyards replaced along will a full sail valet and re-measurement, this all topped off with a full IRC re-measurement in an effort to reduce our TCC ahead of the race. Meanwhile we started to advertise our campaign for the year ahead which included not only the race but 2 dedicated training weekends along with 4 ISORA training races to ensure our crew was fully prepared along with the boat ahead of this year’s race. Lynx performed well in this training races, coming 4th in the Dun Laoghaire to Holyhead and 5th in the Dun Laoghaire to Isle of Man. Once we got around the Fastnet, we were able to crack sails for a great yacht up the west coast, it got a bit breezy at one point where we blew out our A5 in about 35kts of breeze off Galway which forced us to move to our S3. With the clearing weather, we had a great sail around Tory Island while we calculated our approach to the notorious tides around Rathlin Island. Much to our surprise, we hadn’t done a good job of getting to Rathlin on time, we had in fact NAILED our timing, giving us a great run down toward Belfast Lough. In good breeze we continued on a beat down the Irish Sea before being becalmed in Dundalk Bay. Here we struggled on the last night to get into the land breeze where unfortunately some of the lead boats got away… We spent most of the last night drifting trying to sniff any breeze out with the code zero. It wasn’t until the next morning off the Baily that we got going again to sail in good breeze into Wicklow. Lynx finished after 5 days and 49 minutes in the 2016 Round Ireland, coming 4th in class 3, 10th overall and 1st Sailing School boat! It was a fantastic race where I am ever grateful to the crew who for some it was the longest they had ever spent at sea and who all performed admirably throughout the race, they would be a real asset to any offshore campaign in the future. Special thanks also go to Conor Kinsella and Luke Malcolm whom I really would have struggled without their talent and dedication.